Small and practical, it is ideal for use both at home or in the office. Create your custom rubber stamp online using the design wizard, personalised with: a message, name, address, signature, email address or contact details. With an added image or logo if required. The 4914 has a maximum of 6 lines. 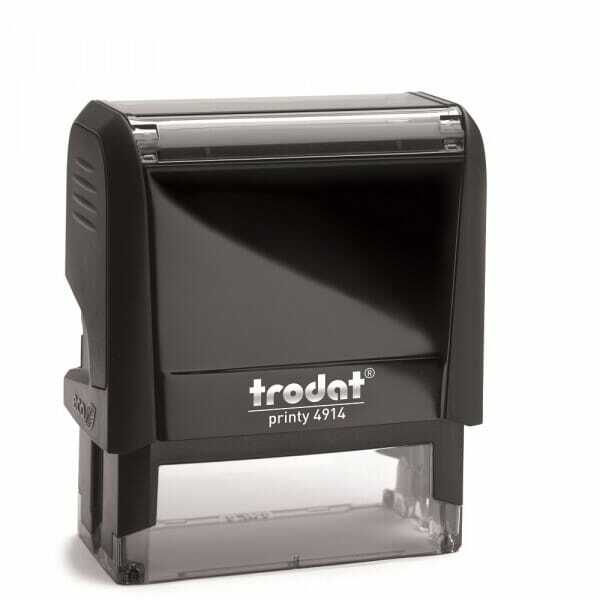 Self-inking Trodat Printy 4914 is produced climate-neutral with maximum possible use of recycled plastic and compensation of unavoidable CO2 footprint by investment in climate protection projects. The compatible replacement pad is 6/4914, which is available in the 5 standard colours: black, blue, green, red, and violet. Dry felt pads are suitable for special inks. New replacement pads are supplied in multiple packs of two. "Trodat Printy 4914 64 x 26 mm - 6 lines of text"
Customer evaluation for "Trodat Printy 4914 64 x 26 mm - 6 lines of text"